Aluminum carabiner of large size and gate opening for easy attachment of multiple items. The Keylock system helps prevent snagging Available in three different locking systems. Large size and opening for easy attachment of multiple items. Pear shape facilitates belaying with a Munter hitch. 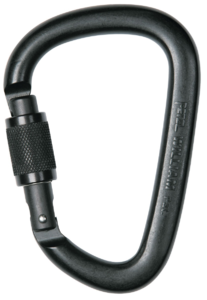 Keylock system helps prevent the carabiner snagging during maneuvers. Red indicator provides a visual warning when the carabiner is unlocked (on SCREW-LOCK version). Three locking systems available (SCREW-LOCK, TRIACT-LOCK, BALL-LOCK), and also available in black.